Happy Thanksgiving to you, Grace. Are you able to be with family this year? Grace my dear, you are killing em with the yum! This looks so, so good! 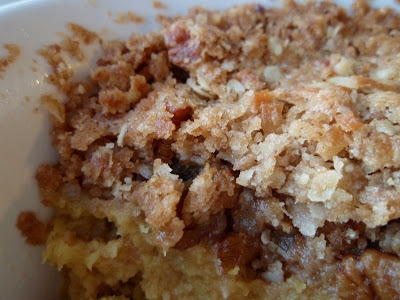 a casserole dish with streusel? girl you rock my blogging world! That certainly looks delish and I bet it tastes even better! Have a great holiday! OMG, that looks mighty scrumètious! Nice combo! I can't believe I've never made a squash casserole. Happy Thanksgiving! May your gathering be blessed and your squash be bountiful. LOL, oops I meant looking, good looking topping! :) That was a freudian slip and hopefully means we're gonna have good luck! mmm, that looks very delicious... does it fall under side dish or dessert? it looks like a good stick to the ribs dish either way. Grace, you are so right about fixing our favorite foods year round. This looks and sounds delicious. Thanks for the Thanksgiving wishes and may you also have a blessed day, too! You can never make a favorite too many times. Looks delicious! Can I be a co-worker? Yum! I've never tried this! Looks and sounds great! This is so creative! It actually looks like a fruit crumble (which I am very partial to). And agreed, some foods just cannot be eaten only on special occasions! Just found your blog. I love it! I love your Southern touches. I am a Georgia girl. 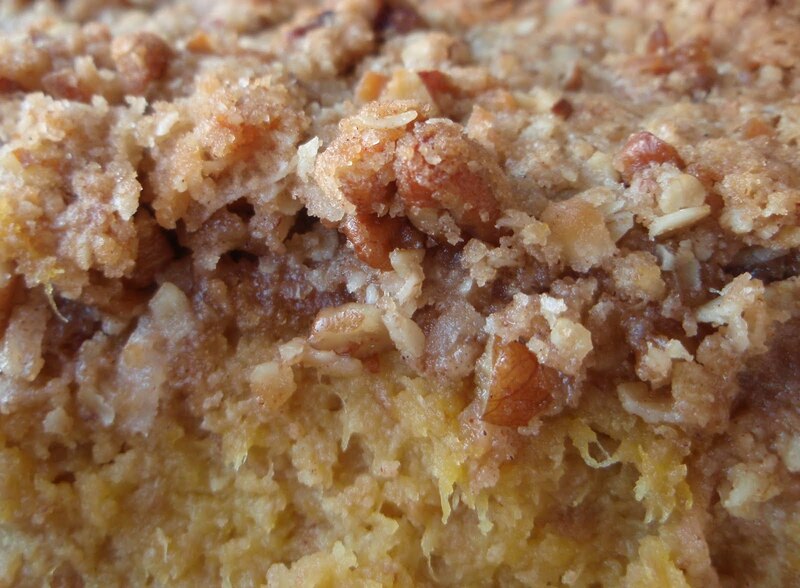 I love squash in and of itself, but I'll admit that my favorite reason to eat it is the fantastic topping! Your streusel topping looks amazing...coconut and pecans?! Oh yes! Happy Thanksgiving, Grace. This sounds great! If zucchini works in cake, this should also! This sounds simply delish... Happy Thanksgiving!!! This looks soo good! I hope you have a terrific thanksgiving! Oh my this looks awesome! I love all the coconut and pecans in the topping....yum! oooh i love this!! it's like a modern foodie updated better replacement for candied yams! YUM!!!! Oh my gosh. I love squash! This would be my favorite dish at the Thanksgiving table, I guarantee it. You're such a southern gal! This is the only way my kids wil eat sweet potatoes. Absolutely no contest that topping is a winner. Yum! Mmm. Love that topping. That would be welcome on my Thanksgiving table! This is a winner! Have a wonderful Thanksgiving Grace! Perfect for the holidays Grace. The oats and coconut in the topping sound great! Great tip about acorn squash too. Happy Thanksgiving! Amazing. I never thought about doing squash this way. I HAVE TO TRY THIS! Bookmarked! This looks fantastic Grace and you are totally right - the topping is the best part. Period. I hope you have a wonderful Thanksgiving - see you next week. That topping is to die for! What a perfect way to eat squash. Grace, Happy TG, sweet friend! Looks great...my dad would have loved this! Hope you have a great Thanksgiving. Hmmmmmmmm good. Deeeelicious. Not to mention nutritious. What a heavenly dish!! So apart too, Grace! I wish you a Happy thanks Giving! I think it is a pity that we here in Belgium don't celebrate this feast! what a great dish! I've never had a squash casserole but this looks so delicious! Sold at coconuts and pecans on top - YUM! That topping sounds superb!! - so good. That definitely looks festive, and acorn squash is certainly under-appreciated. Great Thanksgiving dish! This would be great to make with leftover sweet potato puree. . . yum- looks delicious! OMG! I could live on that topping alone. What a fantastically tweaked dish, printing this out now to make in december. Thank you. That topping is to die for! Love it! I hope you had a wonderful Thanksgiving!